The rise of SOCOM – to train proxy forces in all the places where US projects its power – is alarming. The recent news of a possible shift in the operation of drones from the CIA to the Department of Defense was by and large received with a shrug. Given that the programme would likely be operated by the Joint Special Operations Command (JSOC) and under conditions of strictest secrecy, and probably launched from inaccessible “floating bases” on especially configured naval vessels, the shift is not an indicator of a change in the US’ assassination policy. And to the putative victims of the drone strikes, it is largely an irrelevant organisational change. The reason, however, that the shift is of relevance more broadly is that it signals the irresistible rise of the special operations community in the post-counterinsurgency era. More than a year ago, in January 2012, President Obama inaugurated the US Defense Strategic Guidance. The document was strategically significant because it announced the “pivot to Asia” alongside continued commitments to the oil sheikhdoms of the Persian Gulf. Militarily, it clearly signalled the end of large-scale invasion and occupation of troublesome or intransigent countries in favour of the kind of operations in which the US Special Operations Command (SOCOM) and its counterterrorism component, the JSOC, excel. This ascendancy is confirmed by the planned expansion of the SOCOM by around 7.5 percent by 2015, from 66,100 civilian and military personnel in 2011 to 71,100 by 2015. This expansion of the force, at a time when most US government departments – including the Pentagon itself – are contemplating possible sequestrations, speaks to the increasing importance of a force which can act in the shadows, leaving a “light footprint”. A recent report by the Center for a New American Security describes the light footprints as a “minimalist” and “non-intrusive” approach to asymmetric warfare combining “air power, special operators, intelligence agents, indigenous armed groups and contractors, often leveraging relationships with allies and enabling partner militaries to take more active roles”. US Special Operations Command is perfectly suited for such tasks and is increasingly consolidating its hold over the broad spectrum of military tactics it entails. Established in 1980 and 1987 respectively, JSOC and SOCOM both have their origins in the US military’s failed hostage rescue mission in Iran in 1980. The most prominent operations in which the SOCOM has participated or had leading roles have included the invasion of Grenada (1983), rescue operations during the Achille Lauro hijacking (1985), the invasion of Panama and the kidnapping of Manuel Noriega (1989), the Mideast during the Gulf War (1991), the operation to arrest Mohamed Farrah Aidid in Somalia (1993), re-installation of Jean-Bertrand Aristide in Haiti (1994), classified missions in Bosnia and Kosovo (1996-2002), and of course Afghanistan (2001-present) and Iraq (2003-present). The USSOCOM draws from the special operators of the various branches of the US military, including the US Navy SEALs, the Army’s Green Berets and the 75th Ranger Regiment, the Marine Corps’ Special Operations Regiment, and the Air Force’s special operators. The JSOC, the wholly classified sub-unit of the SOCOM, includes even smaller and more elite groups of the Delta Force and the US Navy’s Special Warfare Development Group (or DEVGRU) which was responsible for the assassination of Osama bin Laden in Pakistan. But while such operations capture the attention of mainstream media and Hollywood producers, other functions of the SOCOM are less commented upon but just as important. In both the aforementioned CNAS report and the 2011 Congressional testimony of Admiral William McRaven, the SOCOM chief, such visible direct operations are said best complemented by indirect approaches. The direct special operations approach usually includes the drone-led assassination programme, and secret special operations forays into a variety of official, unofficial and unannounced battlegrounds in countries around the world. At last count, these countries numbered 71, up from around 60 during the Bush administration. The latter few items of the series above count as the kind of indirect operations that both McRaven and CNAS consider crucially important. The indirect tasks primarily include training and advising foreign security forces in a broad range of countries and operating alongside them. Altogether, by March 2012, according to Admiral McRaven, the US Special Operations Forces were present in some 100 countries. In all accounts extolling the use of the “foreign internal defence” programmes, the special operators and their supporters like to use the training of the Armed Forces of the Philippines and participation in Plan Colombia as their exemplary cases. In the Philippines, the special operators continue a long tradition of intervention in the country which began with the effective colonisation of the Philippines Islands between 1898 and 1946 and continued with counterinsurgency activities in the 1950s. Through this long period, the US forces have fought the Moros of southern Philippines in a variety of guises, both directly and indirectly. 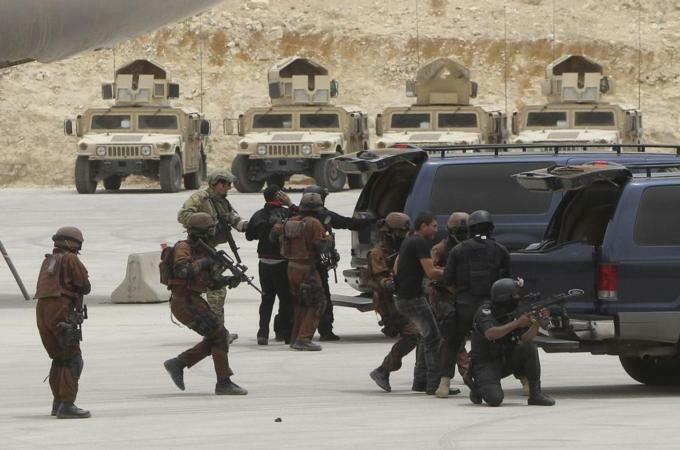 The most recent incarnation of the fight has entailed the SOCOM training of the Philippines Special Operations Forces, and fighting alongside them against the Abu Sayyaf Islamists in southern Philippines. The training began with the initial insertion of 1,200 Special Operations Forces into the country for advising, training and eventually engaging in military operations. Although the Joint Special Operations Task Force – Philippines is still active in the Philippines, they now maintain a much lower profile. Plan Colombia brought together the US State Department, USAID and more importantly, the US special operators, the DEA, the CIA and military contractors to train the Colombian military and the police to both fight the FARC guerrillas and assist the US in the interdiction of cocaine in Colombia (although the extent to which the intelligence agencies have been involved in interdicting drugs has been laid open to question when a plane previously used for rendition – presumably by the CIA – crashed in Mexico carrying Colombia cocaine). Other regions of the world will follow the model established in Colombia and the Philippines in the first decade of the 21st century. The US Special Operations Forces are now operating in Uganda, Libya, Mali, Yemen, and out of the US bases in and near hotspots throughout the world. Where they engage in training or special operations, their fields of activity become useful laboratories for development of special operations tactics and honing of special skills. But the indirect approach and training programmes also establish long-term connections between military officers of various countries and their counterparts in the USSOCOM. The CNAS report on “light footprints” hopefully offers, “as American advisers maintain relationships with their foreign counterparts over the years, lieutenants become captains, then colonels, then generals, and they begin to influence the partner nation’s military from within”. In the same article, she recognises that the local forces trained and supported by the US can be corrupt, “incompetent or abusive”, but she argues that the use of these proxy forces is the “only realistic course for US security policy” short of expensive and unpopular large-scale military intervention. The rise of US Special Operations Forces engaging in kinetic operations and direct action or in using their extensive military, psychological operations and war-fighting skills to train proxy forces in all the places where the US projects its power is alarming. The ascendance of an elite clique of ultra-warriors protected by the cloak of secrecy and pushing off responsibility for acts of violence to their proxies and allies, means that the tip of the imperial spear can tear through the social fabric of many a country without associated costs in blood and treasure and hidden from the view of the press and the public. And because such special operations do not require the sacrifices of an expansive force, the special operators can largely act without public outrage or demand for accountability. The old/new military philosophy of a light footprint is useful precisely because it allows for the war in the shadows to continue unabated and with impunity. The Petraeus Legacy: A Paramilitary CIA? While much of the media focus on l’affaire Petraeus has centered on the CIA director’s sexual relationship with his biographer, Paula Broadwell, the scandal opens a window onto a different and more consequential relationship—that between the CIA and the military’s Joint Special Operations Command. In a behind-the-scenes turf war that has raged since 9/11, the two government bodies have fought for control of the expanding global wars waged by the United States—a turf war that JSOC has largely won. Petraeus, an instrumental player in this power struggle, leaves behind an agency that has strayed from intelligence to paramilitary-type activities. Though his legacy will be defined largely by the scandal that ended his career, to many within military and intelligence circles, Petraeus’s career trajectory, from commander of US military forces in Iraq and Afghanistan to the helm of the CIA, is a symbol of this evolution. As head of US Central Command in 2009, Petraeus issued execute orders that significantly broadened the ability of US forces to operate in a variety of countries, including Yemen, where US forces began conducting missile strikes later that year. During Petraeus’s short tenure at the CIA, drone strikes conducted by the agency, sometimes in conjunction with JSOC, escalated dramatically in Yemen; in his first month in office, he oversaw a series of strikes that killed three US citizens, including 16-year-old Abdulrahman Awlaki. In some cases, such as the raid that killed Osama bin Laden in Pakistan, commandos from the elite JSOC operated under the auspices of the CIA, so that the mission could be kept secret if it went wrong. Despite President Obama’s opposition to messy, large-scale military operations, the president is actually a “very careful hawk” when it comes to military action, Jeremy Scahill argued, in an interview early this year with Francis Reynolds.